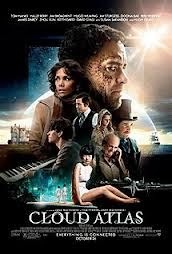 Cloud Atlas isn't just one big movie, its the intertwining of multiple smaller films to make one big movie. The premise behind it that everyone is connected is the thread to tie the various films together. The various stories take place in the past, present and future, While you may notice the subtle details like the comet tattoo that appears on Halle Berry's shoulder in 1973 and Tom Hanks head in the far distance future. But there's other things that are not so noticeable on the first passing. You get so caught up in trying to spot the actor under all the makeup that is sometimes pulls you out of the film and the story. The stories in chronological order include, a transoceanic voyage in 1849, this involves a doctor with murderous intent, while a lawyer Adam Ewing (Jim Sturgess) who decides to show kindness to a escaped slave (David Gyasi) in turn finds that by this act of kindness it into only returned in that lifetime but it ripples forward. The next takes place in Cambridge in the 1930s where a poor composer Robert Frobisher (Ben Whishaw) and his rich gay lover Rufus Sixsmith tell their story in letters as the composer goes to work for Vyvan Arys and pens the Cloud Atlas sextet. This story flows directly into 1973 due to Sixsmith still being alive when he happens upon a reporter Luisa Rey (Halle Berry) who is covering a story about a Nuclear plant and a huge coverup. Move forward to 2012 and you have the story of a book publisher Timothy Cavendish (Jim Broadbent) who gets a nice payday when one of his authors decides to toss the critic who hated his book off the balcony pushing sales thru the roof. When he is unexpectedly institutionalized by his richer brother his escape plan has some of the funnier moments as well as Hugo Weaving as the scary blonde female Nurse Noakes who runs the place. The next is in 2144, a place called New Seoul as Old Seoul is mostly underwater. A clone Sonmi-451 (Doona Bae) escapes with a first officer of the revolution after her “boss” is found dead, She realizes all the ills of the world and what horrors are actually happening then before she is caught and executed by the government broadcasts a manifesto to the world which causes far more than a ripple. Spoiler alert- Soylent Green is people Highlight to read. The last story takes place 102 years after “The Fall” there are people who live on earth who dwell somewhat like cavemen while staying away from the Cannibals, Hugh Grant plays the head cannibal, while other more evolved people live on other planets. This is a lot of movie to take in and that’s partially where it fails. I found myself far more invested in the Composer, the Publisher and the Clone's stories and didn't care enough about the others. I would have probably paid money for the Clone's stand-alone story as it was the one that was so gripping and I cared what happened, I was less pulled out of the story by the other characters in different costumes and more taken with the story itself. This film tries to do too much. That doesn't make it bad but too much of something is not always a good thing. The ideas are grand and while you may think this is an actor's dream you realize not everyone is that versatile. Its someone painful to see some of the actors in different places because not only can you point them out they feel out of place to you. Even so this movie deserves all the makeup and costume awards it can get. Its a visually stunning movie but its still long and overly complicated. Cloud Atlas is a monster of a film at 164 minutes. That being said the movie never really slows down. Just when you think that a story is going to get dull it switches in time to another storyline to continue that forward progression. Its a movie where you have to stop and pay attention to details because you just might miss something. There is definitely an all star cast here with all the main playing anywhere from 3-6 different people in each of the story-lines. Ambitious is probably a good word here. I give this movie a matinee. Its well worth the price of admission you are definitely getting a bang for your buck here with 3 hours of 6 different stories but its overly done is some ways. I hate to think what the hell they cut out of this. It doesn't lag anywhere but even some of the best dramas have some down time for your brain to process. This keeps going and jumps back and forth. Cloud Atlas is rated R.